This was a nice week with the exception of the two horrible headaches I had this week. 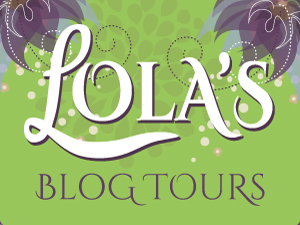 Two new cover reveal and review opportunity went live on Lola’s Blog Tours. My boyfriend and I went out for a few walks around the neigbourhood and enjoyed the weather, I love autumn and how it isn’t too warm and not too cold yet either and we’ve had some beautifull days with lots of sun and we enjoyed our walks. We watched some movies during the evenings this week. We watched the three Rush Hour movies with Chris Tucker and Jackie Chan as the actors. We had a conversation about movies and we both remembered seeing one of the Rush Hour movies when we were younger, so we decided to watch the movies again. They were a lot of fun, lots of action and humor. 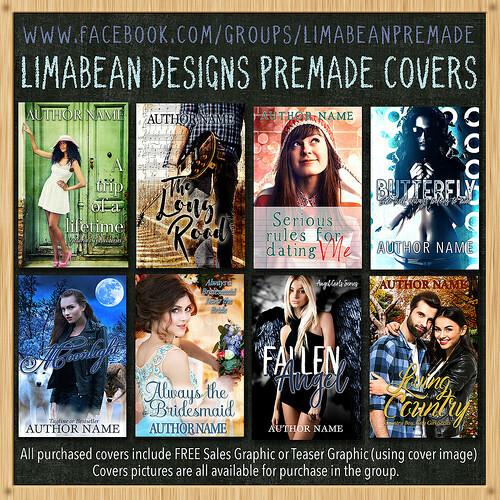 A group of bloggers including me are doing a giveaway! We’re giving away two kindle e-readers. 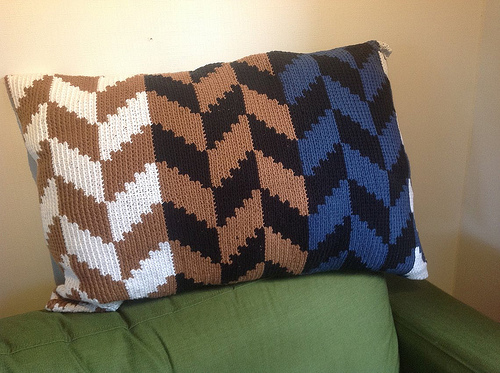 You can enter the giveaway here or on my facebook page here. I also posted the link in the sidebar. I still had a good blogging mood and got some more posts written and scheduled. I got two Lola’s Kitchen posts written, one for a yellow curry and one for nutella cookies. I also got two reviews written for later this month and one post that counts for blog ahead. I also had a great book haul this week, two paperbacks I ordered finally arrived and a book I was eagerly anticipating showed up on netgalley and I got accepted! And I got the third book in a series I enjoy for review. So a great week when it comes to books. My Miffy tea mug that I always drink tea from had a small piece of damage, i cna still dirnk from it, but only from oen side. So to cheer me up my boyfriend bought a new Miffy Mug and an apron in the same style as the old Miffy Mug. Pictures are below. I was really happy with the presents. I really like the dutch Delfs Blauw style of the mug and the apron is cute and comfy. 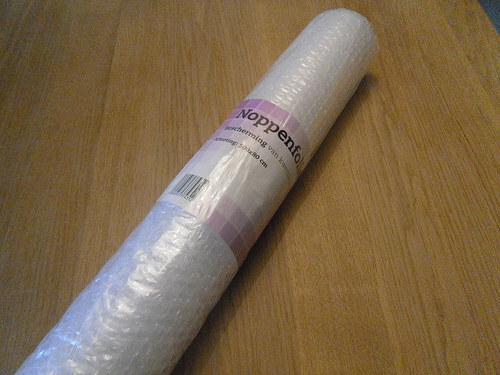 My buble wrap roll was almost gone, so I also got a new roll of bubble wrap. – 2015 New Releases Challenge: 4rd Quarterly recap – 30 December – Have this scheduled and will update it as I read books that fit the challenge. My boyfriend got me some presents and they all arrived this week. The first one was this adorable Miffy mug in “Delfs Blauw”. It’s a typical dutch style of colouring plates and such in bluish tints. This mug also has some dutch decorations like the miffy with the dutch flag, tulips, miffy on a bike, mills and cows, which all are considered typical dutch. It’s very cute and a fun mix of typical dutch and Miffy. And a miffy apron, which matches the style of another miffy mug I have. 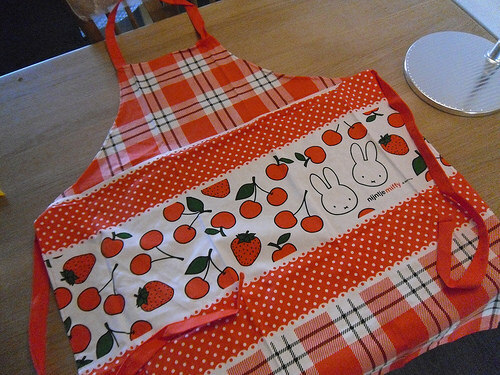 I love the bright orange colour of this apron and it’s adorable with the Miffy faces and fruit on it. I tried it out yesterday when cooking dinner and it’s great, it’s comfy and cute. And a new roll of bubble wrap. My previous roll is almost gone, so I got a new roll, yay! I love popping bubblewrap while I am reading in bed before going to sleep, it helps calm me down. 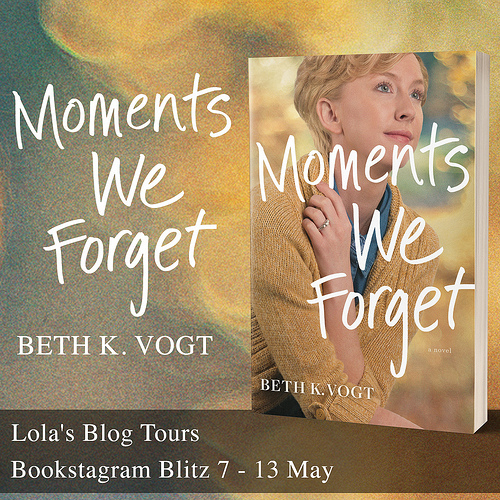 – Lola’s Ramblings: What Characters Do you like to Read About? – Link by Summer Wier – New! 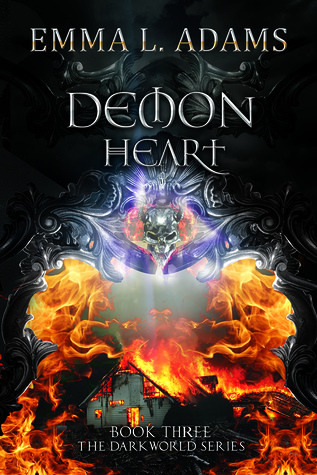 – Saven: Deception by Siobhan Davis – 14 October – New! – Collision by Emma L. Adams – 26 October – New! But guests are expecting a Christmas Eve wedding…! What could be more romantic than a Christmas wedding at a ski lodge in Lake Placid? Well, if there actually was a wedding, for one thing! 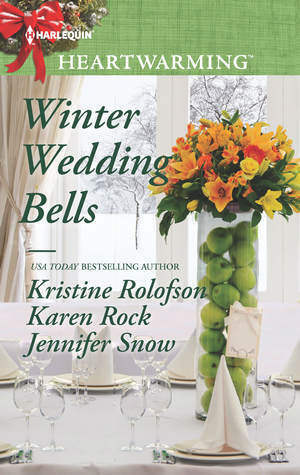 Three stories about getting love right over the holidays by USA TODAY bestselling author Kristine Rolofson and award-winners Karen Rock and Jennifer Snow. The Kiss: A bride runs into her ex…and takes the ultimate gamble! The Wish: An event planner sprains her ankle…and the chef asserts control. Luke Boone doesn’t know exactly what his uncle Rust is involved in but he wants in on it-the cars, the money, the women. And it looks like he’s finally getting his wish. When Rust hands him the managerial keys to the garage, they come with a second set—one that opens up the door to tons of cash and opportunity. Though it’s not exactly legal, Luke’s never been one to worry about that sort of thing. Especially when it puts him behind the wheel of a Porsche 911 and onto the radar of gorgeous socialite named Rain. Clara Bertelli is at the top of her game—at only twenty-six years old, she’s one of the most successful undercover officers in the Washington D.C. major crime unit, and she’s just been handed a case that could catapult her career and expose one of the west coast’s most notorious car theft rings. But, in order to do it, she’ll need to go deep undercover as Rain Martines. Her target? The twenty-four-year old nephew of a key player who appears ready to follow in his uncle’s footsteps. Nathaniel Gresham, the handsome Viscount Hargove, lives a life devoted to familial duty. 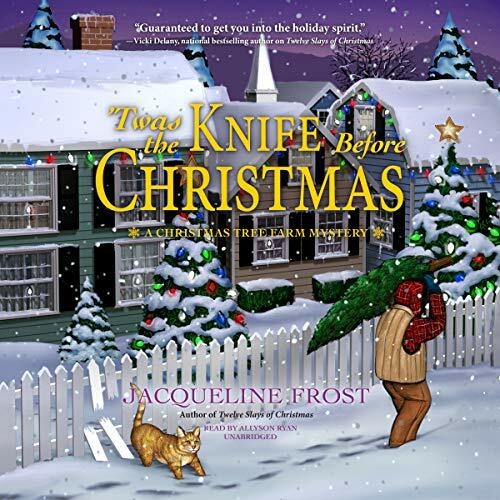 As his father’s eldest son, Nathaniel’s identity remains the “heir to the Duke of Langford.” But this quiet, restrained life changes the minute he marries sweet Lady Violet Devere. Oppressed by her family all her life, Violet is longing for her marriage vows to be spoken. Though her arranged marriage to Nathaniel was not a match made for love, they’re both looking forward to the comparative freedom of married life. And Violet is determined to show Nathaniel how to enjoy it, both in and out of the bedroom. Love your mug and apron, I have no idea who Miffy is but he looks adorable! And I love going for walks in Autumn as well, the air just feels so fresh and bracing and it fills me with energy. Hope you enjoy your KA Tucker books, I think Chasing River might be my favourite in the series because I love the Ireland setting in it. Miffy or ‘Nijntje’ as she’s called in the Netherlands is a she, she’s like the Hello Kitty from the Netherlands. There are lots of products with her on it, I lvoed the picture books when i was a little kid and nowadays I own quite some products with her on it and I even have a stuffed animal Miffy. Autumn and Spring are my favourite seasons as the temperature is just right and it’s fun to take walks outside and see the changing of the seasons. I also have the last book in the Burying Water series pre-ordered, I hope I can continue the series soon. 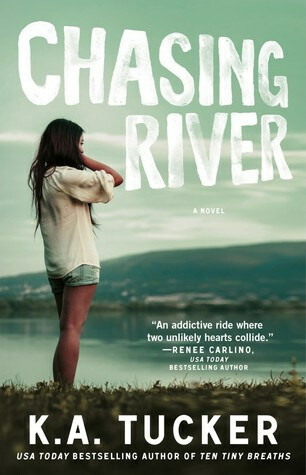 I am really looking forward to Chasing River as I like the sound of the Ireland setting. The weather we’ve been having is so lovely. I like how it’s been sunny and nice without me feeling that I was living inside of an oven. I hope you have a great, headache-free, week! I agree, it’s still sunny, but not as hot anymore. It’s been beautifull weather this past week. I love my new Miffy mug, it’s so cute! I hope the headaches stay away this week too, having two of them in a week was rough. I didn’t know who Miffy was until I saw your photos and I have actually seen Miffy a lot online. It’s always nice to receive a few cool gifts! I used to be addicted to popping bubble wrap! Hope you have lots of fun with your new roll and new books! She’s quite popular and is originally from the Netherlands, hence why we can buy lots of products with her on it. It was great to receive those two gifts. I love the feel of the bubbles popping. I cut the roll into smaller pieces that I can take with me while reading. I’ve heard great things about Run. I picked it up too. Sorry about your headaches. I hope you don’t have any this week. I hope so too, I hate having headaches and having two of them in one week was horrible. I normally don’t like zombie books, but Run sounded good and it was free so I just had to grab it. I’m planning on taking a walk today. Blustery and cloudy but I’m going to get out there with my dog and enjoy the cooler weather. Supposed to warm up again tomorrow. Lots of new lovely books to read. I grabbed Run too! And I enjoyed the Rush movies. Remember watching them with my son and laughing a lot. The cooler weather is great for taking walks and I like seeing the leaves change colours. The Rush Hour movies are a lot of fun, I laughed out loud a few times while watching them. Run sounded good and I had to grab it while it was free. Love your mug. I love the rush hour movies there so funny. Have a great week. I agree the Rish Hour movies are very funny, I laughed a lot while watching them. I am really happy with my new mug, it’s awesome. I have a few more October posts to finish before heading into November posts but today I am HOPING (Fingers crossed) that I can finish a bunch of posts for October and start on November this week. I have so much to do for the end of the year it would be nice for once to be ahead instead of behind. You did get a lot of books this week. The week went by so fast I didn’t have a chance to even look around for anything new. That is a good thing since that stupid slump sort of set me back a bit. Miffy is from the Netherlands, so that’s probably why we can get so much Miffy stuff here. She’s adorable! I still have about 4-6 reviews to do as I am only two weeks ahead at the moment, so it will be another two weeks before I can start on November reviews. I usually blog most at the end of the month, so that’s when I’ll focus on Lola’s Ramblings and Lola’s Kitchen posts for the next few months that I haven’t done yet. I got way too many new books this week, but they are all books I am looking forward to, so it’s a good haul. Miffy is adorable and that mug is just immense as is the apron, I hope you enjoy using them. Bubblewrap is the best stress reliever ever! I agree bubblewrap is a great stress reliever, I love popping them while I read to clam down before going to sleep. I like Miffy, she’s adorable. I already have used the apron and the mug once, so I am sure I’ll enjoy using them. Yay for having a wonderful boyfriend. The gifts are wonderful and thoughtful. I hope you love all your new books this week. I see that we both got the same historical romance this week. They look fantastic. I was really happy with the gifts, I already used my new mug and apron. I spotted the historical romance on netgalley and it sounded like a good one, so I requested it. So many delicious new books. Glad you are getting posts done. Nothing is as sad as chipping a favorite cup..I think the new one is adorable. Hope your week is wonderful, enjoy the Autumn weather. 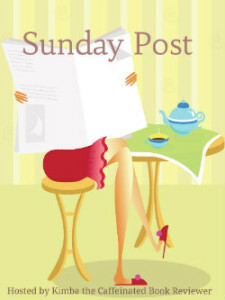 kimbacaffeinate recently posted…Sunday Post #181- Another Year Older.. It was so sad the old mug is chipped, I still use it, but it’s great to have a new one. It was a good week for books. 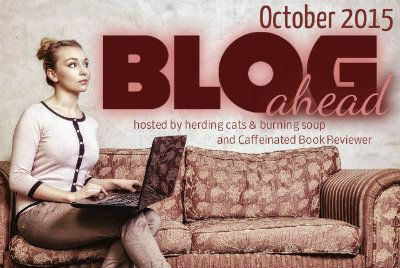 It looks like you making a good start with the blog ahead challenge. I’m also working on October right now and I haven’t got a lot of posts ready that count for the challenge.. but I have lots of ideas.. So I’m positive. I figured I would go with the english name for her, so everyone would know who I was talking about. Nijntje is adorable ;). There aren’t many dutch english bloggers around so it’s always nice to meet another one :). I only realized you were a dutchie too when I followed you on twitter and saw the country listed there. 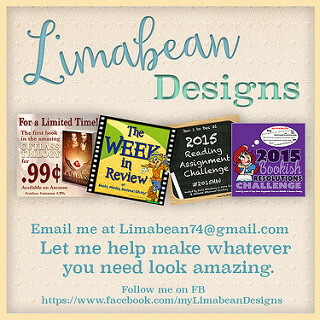 I have a few more posts ideas for the Blog Ahead challenge so I hope I can get a few more written this week. Most of my blogging is done in the last few weeks of a month, so the first few weeks will likely be a bit slow. Your mug and apron are really cute. Fall is a great time of year for walks or whatever, not too hot and not too cold. 🙂 I like it that way. Me too! This week the temperatures were just perfect for walks outside. Once again you are teasing me with scrumtious Cajun pasta and a super-sweet boyfriend. 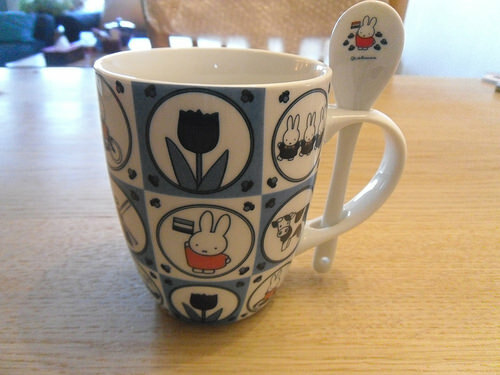 I am not familiar with Miffy, but she is very cute and I like the attached spoon. The cajun pasta is very easy to make and really good. I usually don’t use a spoon as I don’t add sugar or milk to my tea, but I do like the attached spoon. Wow, you got a lot of books this week! And I just ADORE the Miffy mug and apron! How adorable! She is one of my favorite cartoon characters next to Hello Kitty. Maybe it’s the lack of a mouth? Hello Kitty doesn’t have a mouth either. Just whiskers like Miffy. Hmmmm. I am not sure if getting this many new books in a week is a good or a bad thigns, but i am looking forward to read them all. I agree Miffy and Hello Kitty are both so cute. Maybe it;s the lack of mouth that makes them cute, those whiskers make for a cute face. I really like my new mug and apron. I already have the recipe for the nutella cookies scheduled for end October, they are very good! And they really taste like nutella. Thanks! I bought Guidebook to Murder yesterday evening after your recommendation and I noticed it was very cheap. Ooh, lots of goodies in your haul. Hope you are able to get through your October posts so you can get a few done for Blog Ahead. I sent over a few posts for Shari to use for Blog Ahead, so far. I hope to do a couple this week along with my usual group of reviews. I still use the old mug, but I have to be carefull not to drink from the chipped spot. So I am really happy with the mug and I was so happy he also got me a new apron. It was a good haul this week, let’s hope I can manage to get less new books next week, lol. I am only two weeks ahead with review posts as I don’t read as fast, so it will probably take me another two weeks before I start on november reviews. I do hope to get a few Lola’s Kitchen and Lola’s Ramblings written for the next few months. Thanks, he’s definitely a keeper. I like the spoon in the handle too, although I don’t use it as I never add sugar or milk to my tea. That’s a cute mug and apron. That is really thoughtful of your boyfriend. I would love to do the blog ahead challenge but it all depends on when I finish reading a book. I hope you enjoy your new books and have a great week! I am the same with my review posts, it all depends on how much I read when I can write them. 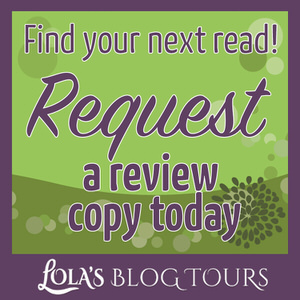 I do try to stay ahead with my non review features like Lola’s Ramblings and Lola’s Kitchen. A lot of participants focus on weekly features or memes as well. Even if you don’t manage to get as many books done, it’s a very motivational challenge to be part of and it’s a lot of fun. I try to stay ahead with my Lola’s Ramblings and Lola’s Kitchen posts, I do most of my blogging towards the end of the month, so that’s when I reach my highest number of scheduled posts. I try to be two months ahead with those two features at the end of each month. Beside that I schedule a lot of recap posts for the day they go live and then update them as I go. And I was about two weeks ahead with reviews when I started this challenge, so that helped too. 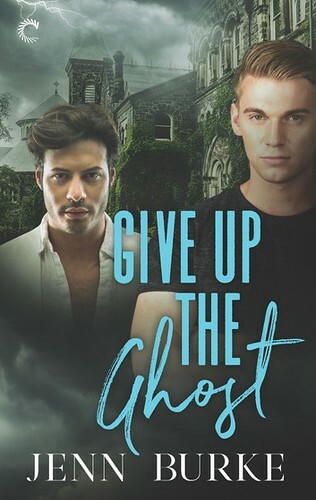 I just love it when a book that’s already on my to-read list shows up for netgalley and then I get approved, it’s the best! What an awesome boyfriend! That cup and apron are really cute. My kids always want to pop any bubble wrap they find. 🙂 Great haul too! Thanks for stopping by, Lola, and have a fantastic week! I love bubble wrap and always popped every bubble wrap I could find as a kid too, I am glad to have a whole roll now ;). I agree popping bubbles always calms me down. Scheduling ahead get’s easier once you already have a buffer, at least it works that way for me. The Blog Ahead challenge is veyr motivational to get posts written and I ejoy participating. Aw that was very sweet of him to get you new replacement goodies. Hope your headache’s have passed! Luckily the headaches passed, they usually hang around for a whole day before they disapear though, so I hate it when I get one. It was still a great week with the exception of those headaches. And I am really happy with my new mug. The mug and apron are so cute. 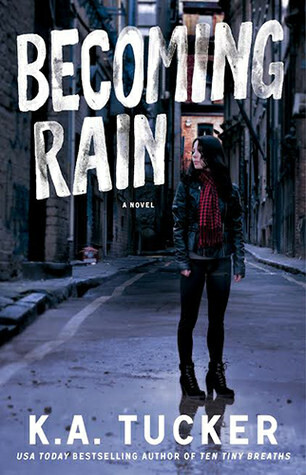 I enjoyed Becoming Rain on audio and look forward to listening to Chasing River. Have a great week. I only read Burying Water so far, but I really enjoyed it and am happy to be able to continue the series now! I don’t think I ever have seen Miffy cartoons, but I had books by Miffy when I was a kid. Nowadays I just have multiple products with her on it as I think she’s cute. That’s a shame you don’t like Rush Hour, I thought the movies were a lot of fun. Love those boyfriends that do sweet unexpecting things right? 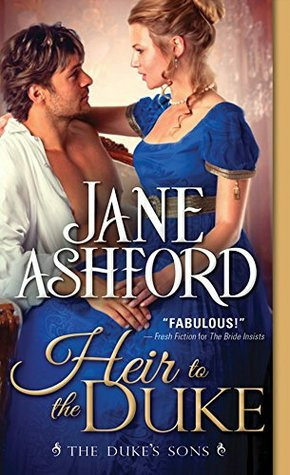 I hope you enjoy Jane Ashford’s book…that cover is one of my favorites. So cozy and romantic. Love how at ease they are with each other. I hope so too, it’s my first book by that author, it sounds really good. And I like hwo the cover is so cozy and romantic.